Asheville Community Yoga is a 501(c)3 nonprofit organization built on the power of volunteers and Karma Yoga. 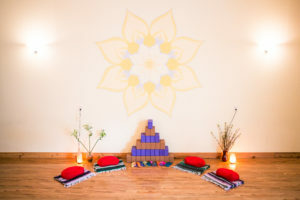 Your time and talents are highly valued and appreciated and truly allow us to continue to serve the Asheville region and fulfill our mission of making yoga accessible to all. Below are our current volunteer and studio credit opportunities. Each of our 80+ teachers are all volunteers and receive no monetary compensation for their classes. Once you become a teacher at Asheville Community Yoga you are able to offer paid programming including workshops and special events. We do not allow any outside guests to offer paid programming for our community as we reserve this space entirely for our volunteer teachers. To become a leader in this community and step into the role of teacher please email Wendy@ashevillecommunityyoga.com. Please include your bio, teaching resume, website (if applicable), teaching credentials, and any other pertinent information. Did you know that our small thrift shop pays close to 1/3rd of our monthly mortgage? It’s true! Zen & Now is a huge part of what allows us to keep our doors open to all, offer high quality props free of charge or rental fees, and pay for operating expenses. Volunteering at Zen & Now includes sorting through donations of clothes, shoes, and accessories, pricing items, displaying them, and checking out customers. To volunteer at Zen & Now please email Dana@ashevillecommunityyoga.com. In February 2018 we began offering donation based childcare to our community. We have been extremely lucky to have found dedicated and skilled childcare professionals to make sure all children who are kept in our care are enjoying their time and stay safe while their parents or caretakers enjoy the many services Asheville Community Yoga offers. We are currently looking for childcare volunteers for Sunday mornings from 9:00am-11:30am. Currently there are no volunteer openings… stay tuned. For more information about our Childcare program please email Sarahb@ashevillecommunityyoga.com. We have many special events per year, and we can always use extra hands to support setting up, breaking down, and facilitating parking, among other duties. To join our Special Events team please email Jocilyn@ashevillecommunityyoga.com. This job for the studio is in exchange for $18 per shift. Each shift includes cleaning bathrooms and lobby spaces and takes around 1.5 hours. This opportunity is more than cleaning, it is a true opportunity to put your personal practice to work by noticing small details in the specific action you are involved in, while also maintaining a general awareness of the needs of the studio as you operate through it. It is a true mindfulness experience, one that can be calming and bring one great satisfaction from a job well done. Please note you are required to attend a training session before you can be scheduled for a shift, and training can be done during the shift you are applying for. To apply please email Jocilyn@ashevillecommunityyoga.com stating your cleaning experience, how long you are able to commit to this position & which shift(s) you are requesting. Experience preferred but we will train you if you are dedicated to service, timely and diligent! Please email Jocilyn@ashevillecommunityyoga.com to schedule. This position is an opportunity for practicing mindfulness and precision, an opportunity to stay present with your breath and movements as you float from dish to dish. How gently can you work while maintaining an essence of urgency? Please note you are required to attend a training session before you can be scheduled for a shift. To apply please email Jocilyn@ashevillecommunityyoga.com stating which shift(s) you are requesting, any experience you have in dishwashing and how long you are able to commit to this position.